Mixing It Up has challenged me to read my first-ever graphic novel. This is a genre that has never even been on my radar. Never read one, or even considered reading one. But it's good to stretch our boundaries a bit, and I'm so glad I did. The subtlety and depth that can be communicated with cartoon sketching and some well-chosen text were a great pleasure to experience. 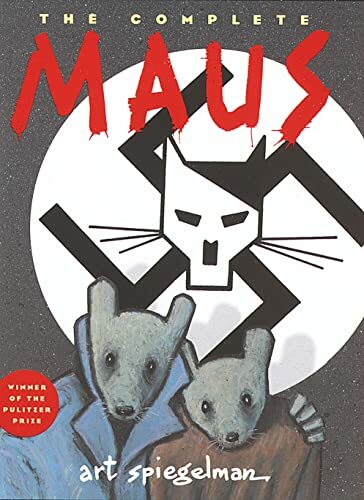 Based on interviews with his father Vladek, a Polish Jew who survived Auschwitz, Art Spiegelman's Maus tells Vladek's story. But it isn't just Vladek's story; it's Vladek's story interwoven with the fraught, complex, love-hate relationship between the father and son, as the father tells his story while his health deteriorates. Maus consists of two volumes: I--My Father Bleeds History, and II--And Here My Troubles Began. In the first volume, Vladek tells of his youth, marriage, and the early years of the Nazi occupation of Poland, leading up to his arrest, with his wife Anja, and their transport to Auschwitz. The second volume describes Vladek's and Anja's experiences in Auschwitz. Art Spiegelman uses animals to represent different ethnic groups. The Jews are mice, and the Germans cats. Controversially, he depicts non-Jewish Poles as pigs. (Spiegelman has said that he represented people as the Germans did--the Germans themselves called the Poles pigs, and the Jews rats. And he doesn't depict the Poles particularly negatively--Vladek and Anja would not have survived without the help of Polish friends.) The French are frogs. He plays with these animal personas in interesting ways. Jews passing as Polish Gentiles, for instance, are drawn as mice wearing pig masks. His wife Francoise, a Frenchwoman who converted to Judaism, is drawn as a (very stylish) mouse. The story cuts back and forth between present and past, and this is its great strength. The three narrative threads--Vladek's story, Art's struggle to present it via his art, and the relationship between father and son--spiral about one another, each coming into view in turn, and none separable from the others. Vladek's trauma has made him who he is, and his son finds it very difficult to relate to him. Art wrestles with his conflicting feelings for his father as he tries to present his story. And somehow it all flows together in a seamless, page-turning read. One of my all time favorites! So well done, though also so sad. Really amazing book. My first graphic novel was Persepolis, which was amazing. Maus was then recommended to me, and I was blown away by it! Graphic novels for sure aren't my favorite genre, but I have been amazed by those I have read. Spiegelman has a book out called MetaMaus, in which he is interviewed about the making of Maus. (I was reading the excerpts on Amazon yesterday.) He talks about the challenges of conveying a nuanced story in tiny bits of text and drawings. It was interesting to read, as I'm also not really a graphic novel lover, but loved Maus.